But the RV-14 is different. Probably the first thing you'll notice is that the RV-14 sits tall. The upright seating position and large bubble canopy provide superb visibility in all directions. The large cabin (as wide as many four-seat airplanes) is truly roomy. Lots of headroom, lots of legroom, lots of room between the seats. Big people will like this airplane! Up front, a 210 hp Lycoming IO-390 lives under the graceful cowl and supplies plenty of power! A Van's 4-into-1 exhaust system keeps exhaust noise relatively low, especially in the cabin. Occupant protection is an important concern. A massive rollover bar spans the cockpit just behind the seats. 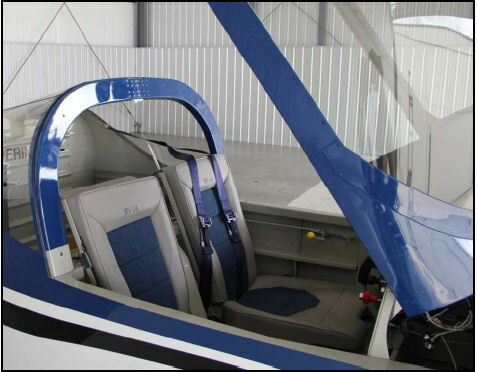 Seats, belts and harnesses are designed to keep pilots and passengers safely restrained. 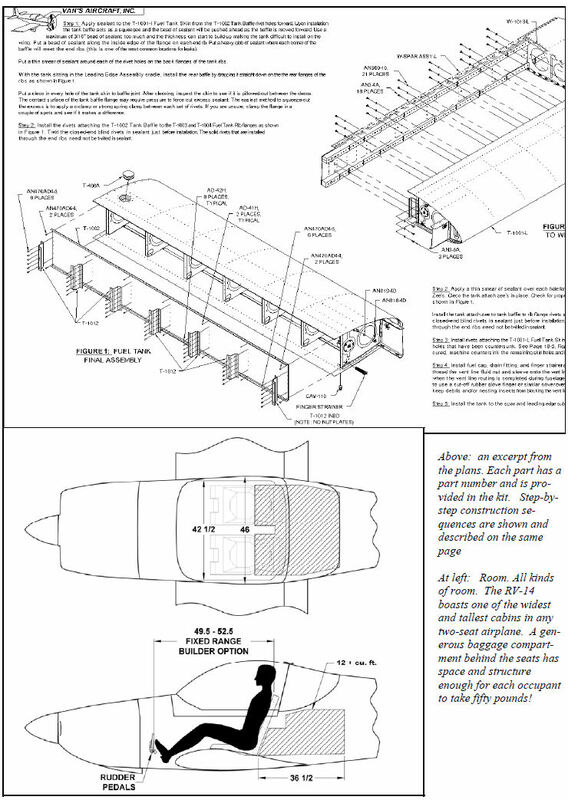 The RV-14 cabin accommodates full-sized adults - in fact, the basic idea was to provide RV-10 room and comfort in a two-seat airplane. The results are impressive. Both seats will hold people at least 6'4� tall and provide them with truly comfortable leg and headroom. The thing that has always made RVs stand out, from the original RV-1 to the RV-14, is the way they feel in flight. The famous �RV Grin� can be found on any pilot who has just taxied up in one...the result of a flight in a truly responsive, agile airplane that goes exactly where you want it to - almost as if it read your thoughts directly. The RV-14 continues this tradition. It responds almost instantly to the pilot's touch, but that response is predictable, proportional, and precise. It handles basic aerobatic maneuvers easily and gracefully. The structure meets the aerobatic category standards of +6/-3Gs when flown at the aerobatic gross weight of 1900 lbs. 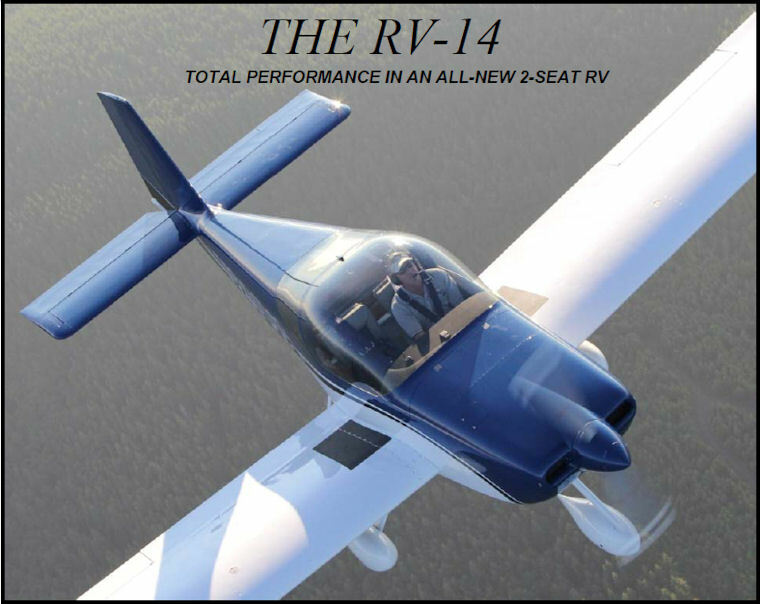 RVs are known for short-field capability and the RV-14 is no exception. The generous wing area and big slotted flaps allow the RV-14 to land at virtually any small airport. It is perfectly happy on grass, dirt or gravel runways. If you can land closer to your destination, you can gain a lot of time over �faster� airplanes that must use big paved airports a long way from town. Even at gross weight, the RV-14 can operate from very short runways and climb well at high density altitudes. When many pilots say �performance�, they really mean �speed.� By most standards the RV-14 is quite a fast airplane, but speed is only part of the story. The RV-14 derives its high cruise speed from a light, clean and fairly small airframe, instead of from a big, consumptive engine. This means not only will it cruise at relatively high speeds, but cruise at lower speeds can be very economical. Company pilots often choose to cruise at 50-55% power and take advantage of the economy available there. 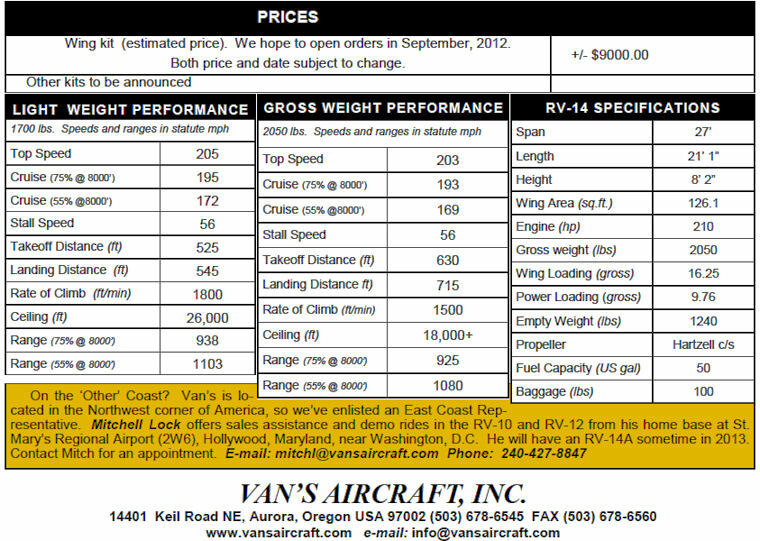 At 175 mph, the RV-14 is getting better miles-per-gallon than most of the luxury cars and SUVs it is flying over. Pilot workload is very low, because the airplane responds quickly and positively to small control inputs. It is not the least bit �twitchy� and does not require constant attention to maintain heading or altitude. Cruising at 70% power and 190 mph, it can cover about 1400 nautical miles in eight flying hours with just one stop for fuel. At economy cruise, it can do thousand mile legs if you can! A long trip in the RV-14 can be positively relaxing. The RV-14 kit has the full benefit of the RV kits that have gone before. It comes into the world ready to set new standards in completeness and accuracy. We expect that with these improvements, builders will complete RV-14s in significantly less time than the other 'driven-rivet' RVs. All the aluminum components are formed and pre-punched for all the rivet and bolt holes. The �matched-hole� punching technology makes the airframe essentially self-jigging: when all the holes line up, the airframe must be straight. As with all other RV kits, all welding is complete. Wing spars come fully assembled and ready to install. The canopy has been the focus of considerable design effort. It should install with much less effort than any previous RV. Fully designed wiring, avionics and engine installation packages will be available that reduce the time spent on those traditionally very time-consuming tasks dramatically. A QuickBuild (QB) will become available after Standard Kits are released. For either kit, you'll need a shop about the size of a two-car garage, an air compressor, bench grinder and a set of aircraft hand tools like rivet guns, dimple dies, etc. 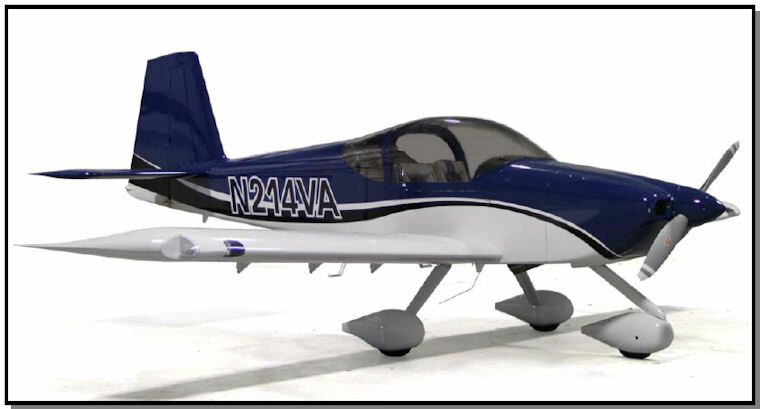 We expect RV-14 wing kits (which will work for either tailwheel or nosewheel versions) to become available in the autumn of 2012. These will include everything necessary for a complete set of wings: fuel tanks, control surfaces, completely assembled spars, molded wingtips, etc. The price is yet to be determined, but a preliminary estimate is around $9000.00. After that, empennage, fuselage, and finishing kits will be released in due course. We think the RV-14 will be a great addition to the RV story - adding its new abilities and features to what is already the most successful line of kit aircraft in the world.